I certainly have a viewpoint, but what overrides any opinion on the matter is that nobody is left feeling they have done something wrong. And how can anyone associated with the Club have done that last Sunday. LukeO9 wrote: I certainly have a viewpoint, but what overrides any opinion on the matter is that nobody is left feeling they have done something wrong. And how can anyone associated with the Club have done that last Sunday. I was 22 when we one the premiership in 1983. It is just a magnificent feeling. Premiership TShirts for my son and nephew. 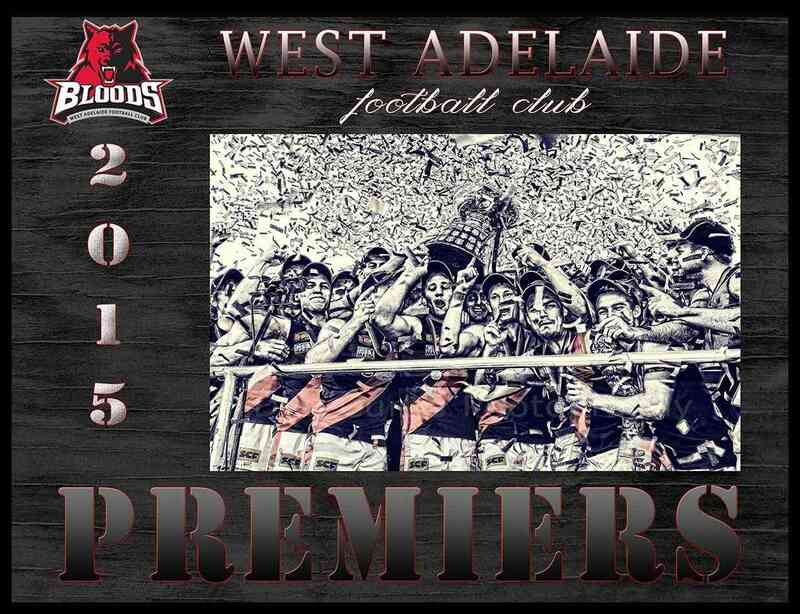 What a fantastic performance by the whole West Adelaide Football Club. Thank you to the Coach, Players, Board, Staff, Volunteers and our very special Football Manager, Andrew Marks. You have all made many loyal, dedicated supporters very happy and content. Let us build a dynasty. 6183 wrote: What a fantastic performance by the whole West Adelaide Football Club. Thank you to the Coach, Players, Board, Staff, Volunteers and our very special Football Manager, Andrew Marks. Without meaning to drag up any past comments or contraversy about a picture taken in haste on the day. Is it the intention of the club to have proper official studio type photos taken of our premiership team with and without support staff and made available to members? I for one would love one and suspect I am not the lone ranger. Naturally a copy would be placed proudly in our hall of fame for evermore. To everyone involved.....thankyou,thankyou,thankyou you have made the years sitting on the terraces suffering heartbreak during the lean years so worthwhile.Now we are premiers,top of the heap,let the others come try and knock us off.I reckon with this talented bunch we can be around the top for years.Mickan your bathwater needs bottling! Caan you guess I just a little bit happy? The official photo of the Premiership team was in the Advertiser last week and I'm sure would be available through them or the club. TAAARS, rapt for you, mate. Years of so many of us on the forum having a chat at the footy, hoping for a premiership and now Mark and the players have achieved one. Micky Newham, Jean Luke and so many others would be celebrating from above. I used to play footy with a rolled up sock with my brother (blacky) in the backyard as a little kid and I got to have a big man-hug with him as fellow officials of a Westies premiership team (his 2nd) on the oval all these years later. All Westies fans no doubt have similar stories to tell. What a wonderful year, what a wonderful club and what a just reward for all those supporters who have stuck with us through everything. Enjoy it, TAAARS, you deserve to. I am over the moon with Westies winning last Sunday! What a feeling when the final siren went, I couldn't stop yelling and waving my Bloods scarf. Also to look around and see all the Bloods supporters faces, some with huge smiles, some crying with emotion and plenty hugging each other. I was so glad that this time I could go to the game as with our last premiership we were living in Sydney and I could only listen to the broadcast on short wave radio. If anyone hears that a dvd is produced please post on here. Finally thank you to the Mark Mickan, all the senior players and importantly all the support staff that contributed to our premiership year. Would really like to do it all again! Good to hear beaglex short band radio. You deserve a medal Sir. Ok Jason, think i'l go on Facebook and see if i can buy one. My sincere apologies to Porps meant no offense to a true legend of our Club. Lee Harradine wrote: The official photo of the Premiership team was in the Advertiser last week and I'm sure would be available through them or the club. The official Premiership team photo didn't have Webby in it . I would hate for that photo to be put up in the club for years to come as the Premiership team of 2015 without the starting ruckman. Webby was brilliant in the finals. I'm sure he'll be in the official photos. When's the first 2015 Premiership Reunion Function? What about this Sunday? You're right Lee. Login updated from 6183 to 618315. Let's hope I have to change it more regularly. As the original poster of this thread, i was a bit disappointed that it drifted off topic. I was hoping this would just be a threat to celebrate and congratulate! lets share in this one together and with unity! Perhaps mods could remove any of those previous off topic posts about photos elsewhere? Anyway, Whilst it has been mentioned how much of a great team effort it was on Sunday, just wanted to highlight a special mention - How good were Haysman and Snelling on Sunday! Showed much much more maturity than their teenage years! How good was Haysman selling some candy! and what about Snelling's vision and pass in traffic in the final minutes to Greeny to kick the sealer! These guys (and Agostino who played a blinder in the prelim) proved me wrong. I was worried about their bodies being weary come finals time, but they stood up more than half of their more experienced Eagles opponents. Unfortunately i don't think we will have them for much longer, but i wish them all the best and thank them for their amazing service this year - and hopefully they'll come back after their AFL career and finish off where it all began - with the bloods! Just like Porps. No that's been done for as long as I can remember dl. Having just watched the game back, the player we'll certainly miss the most from that side is Snelling. He was very very good. -We worked harder than them. -We kicked out of bounds on the full 7 times. -In last quarters over the 4 games against the Eagles this season we've outscored them 17 goals to 4.
aldo russian wrote: When's the first 2015 Premiership Reunion Function? What about this Sunday? Congratulations to all the players and our great senior coach Mark Mickan. What a great final series we had, knocking of the ferals, smashing the in form Bulldogs and then beating the best performing team of the year in the grand final to become premiers of 2015. The feeling of mingling with everyone on the ground after the final siren was one I will never forget, and then in the changerooms after the players had completed there victory lap, every conceivable discription of happiness and relief was there on all the faces. With what I do on match days for the club and being in the coaches box I shall never in my life forget the atmosphere as soon as the siren went, all of the coaches and stats staff were so happy to finally feel what it is like to win a premiership.